So you’re wondering where to eat, and your friend says, "How about some chicken?" You say to yourself, "Hmmm...that’s not a bad idea...". And then you say, "So, you wanna go to Kevin?" And then your friend goes, "No, Kenny"
And you say again "No, Kevin." "We’re talking about the same place right, that place famous for its roasted chicken, owned by that bearded country dude, right? Kenny Roasters, right?" And you say "Duh!! 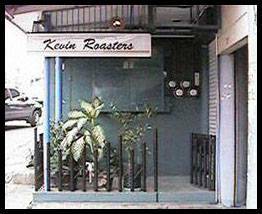 I mean Kevin Roasters!!!" "What?!! There’s no such thing! You’re a moron!" Little did your friend know that somewhere on Wilson St., San Juan, a small but homey little store offers not only roasted chicken, but all sorts of grocery items, including liquor (Tequila, Vodka, and the like.) Hah! Now who's the moron? Bring him over and watch him eat his words/ chicken.